Autumn is finally here and what a beautiful time of year it is. Though it is a sign that winter is on the way, the fall season presents us with a great many comforts, adventures and happenings. With that said, the folks here at Auto Clinic of Franklin want to remind all our clients that driving in the fall can be somewhat challenging and even dangerous at times. Autumn driving typically involves scenic routes that give way to fun filled adventures. However, fall driving can also give way to a variety of dangers as well. The temperatures in this autumn season have begun to drop. The fall days are much shorter than those hot, humid summer days and the leaves are all changing colors, paving the way to the winter months ahead. Now that autumn is here, there are a few driving challenges that may present themselves as we begin to prep for the change in seasons. Our friendly and professional team here at Auto Clinic of Franklin wants to help keep you and your family safe with some simple, but important tips you should keep in mind when you head out to drive this fall season. For starters, always keep a keen eye out for children. 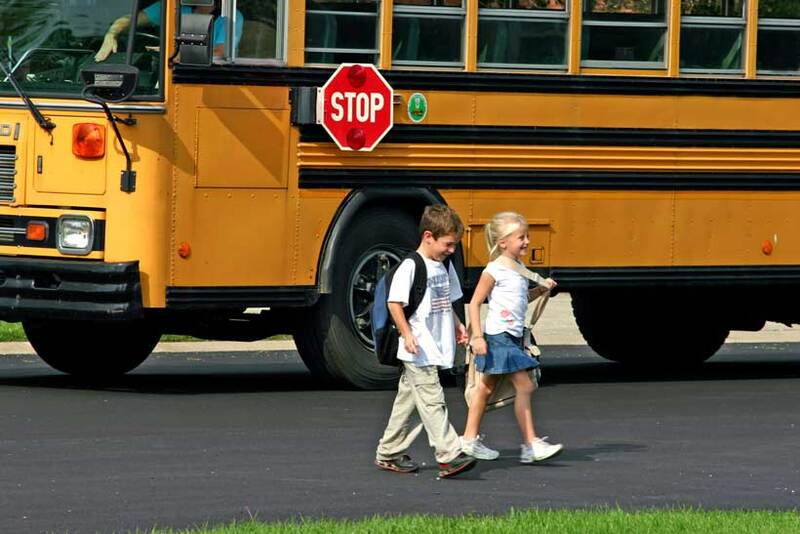 Since school is in session and school buses are transporting children to and fro, you want to be extra cautious of all those children getting on and off the buses. The days are shorter and in some instances, children are being transported during dusk, which is all the more reason you want to be closely focused on school buses and children. Next, be sure to have a comfortable pair of sunglasses easily on hand when autumn driving. The morning sunlight in the autumn months can be incredibly bright so you want to ensure that you have a good pair of sunglasses on hand as you hit the road. An anti-glare pair of sunglasses is always the best option. If you haven’t a pair of sunglasses accessible and the glaring sun gets far too bright while driving, pull over onto the side of the road and wait a bit for the sun’s glare to subside. Don’t take chances and try driving in the glaring sunshine since this can, often times, result in accidents of all types. The sun can certainly present challenges when driving and can even do so if you don’t have the right type of sunglasses to wear. So, drive with extra care during the early autumn mornings. Our next useful tip is simply to give a great deal of attention to falling leaves, wind and rain, fog and early darkness, all of which can cause serious issues with the traction on your car and your overall visibility as well. Whenever any of the conditions are present, and most of them are present throughout the entire fall season, be sure to slow down your driving and use your headlights whenever you are experiencing problems with visibility. Many accidents occur in the fall months because of the mixture of rain and leaves. When the weather is wet and mixed with leaves be sure to keep a good, safe distance from the car in front of you to allow yourself plenty of needed room for braking. This combination can cause very slippery driving conditions and can even be treacherous resulting in accidents, both minor and major. So, drive with extreme caution when leaves, rain and fog are present. Finally, last but not least, make it a point to keep your windshield clear and clean. With dropping temperatures in the autumn months and mixtures of rain, ice can become a bit of a threat, so you want to be sure that you scrape your windshield in the morning before heading out. Also, when driving in the colder fall temperatures be vigilant about dark spots on the road since they can actually be patches of black ice and lead to some serious driving issues and accidents. 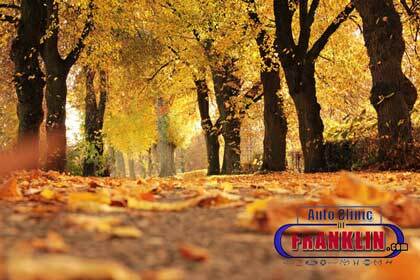 We all here at Auto Clinic of Franklin want to be sure that you are safe this autumn and every autumn thereafter. With that said, we hope you found these important tips useful and don’t forget, should you be in need of any type of vehicle maintenance, repair or services, we are the team for you. We take a great deal of pride in our superior products and services and look forward to providing you with all your automotive needs whether winter, spring, summer or fall. Be cautious, be smart, be safe! !